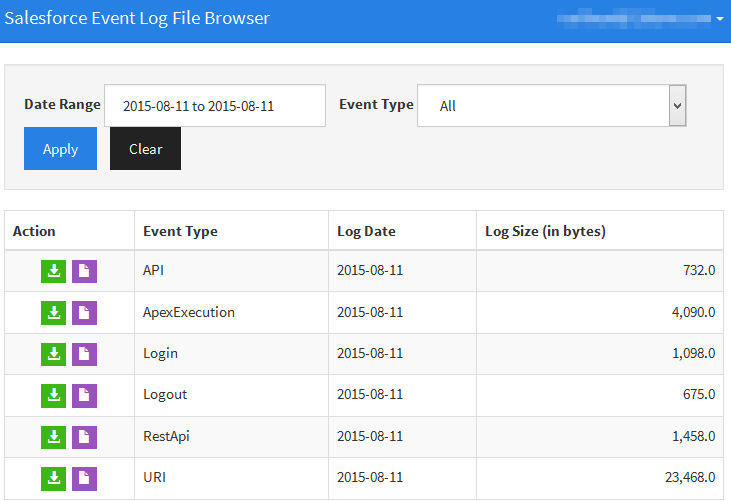 As of Winter '15 release, Event Log Files has been Generally Available. It contains useful information for assessing organizational usage trends and user behaviour. 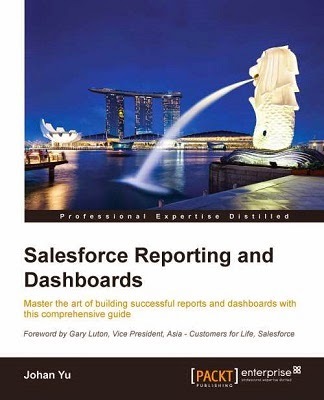 However, there is no access through Salesforce user interface, you only can access the data through the Force.com REST API, this mean you can write visual force page with apex code for the UI, but fear not, I'll share few free app able to access the data. Log files are generated asynchronous, one day after an event take place, but this should be good enough to understand your user usage. Log data is read-only, you can’t insert, update, or delete log data. It does NOT count towards org file storage. For Production org (Enterprise, Unlimited, and Performance Edition), you need to purchase User Event Monitoring to get this feature fully activated, otherwise you will have free access to the login and logout log files with one-day data retention only. Once purchase, you can access all log file types with 30-day data retention. So, it is good idea to integrate this data to your back-end database for further analysis. 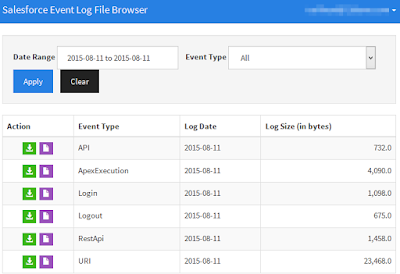 Once it enabled, you will see object called EventLogFile from API. As you can see in query result, it will create a record for each LogDate by EventType. The content is stored in LogFile and you need to read it with code, or you can use REST tool for testing. How to read the log file? * Go to Setup | Develop | Custom Settings | Rest Explorer Configuration | Manage | New. * Set the name to 'baseUrl' and the value to your Salesforce instance, for example 'https://na1.salesforce.com'. 2) Configure a Remote Site Setting. * Go to Setup | Security Controls | Remote Site Settings | New Remote Site. * Set Remote Site Name to the name of your choice, and set Remote Site URL to the same value of the baseUrl above, for example 'https://na1.salesforce.com'. Then you can access it through a new tab created REST Explorer. Enter LogFile value from query above to the textbox provided. Credit and thanks to Adam Torman for sharing sample code, how to access Event Log File via Visualforce and Apex code. Click Execute button, it will show total record the same as you query from Developer Console. It will display Raw Result the same as using Rest Explorer installed package above. You can copy and paste the result from header "EVENT_TYPE","TIMESTAMP" ... into Notepad and save as CSV file. Sample CSV file for Event Type = ReportExport. 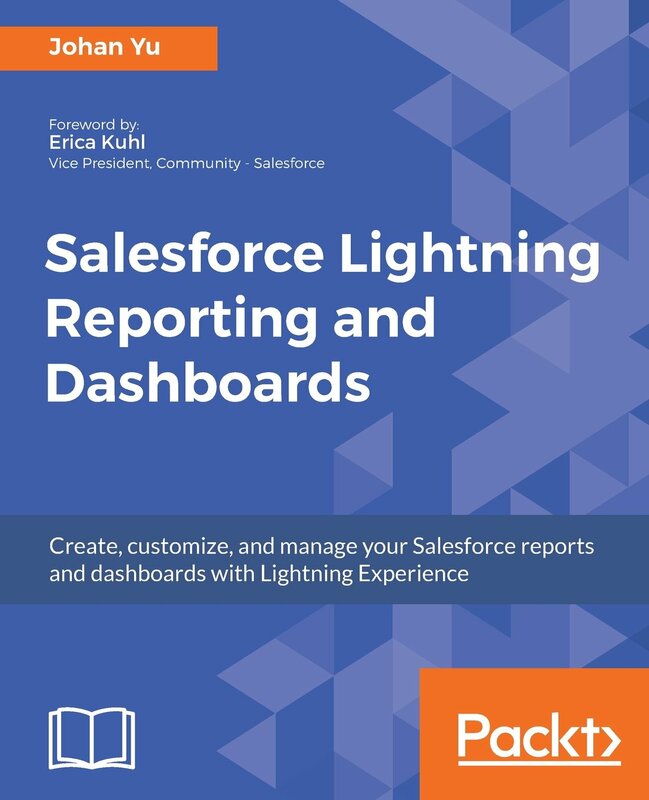 This application is pretty simple, open the URL above, select login to Production or Sandbox and allow Salesforce Event Log File Browser to access your Salesforce data. Once you are in, you can download each event log into CSV file.